Tor.com. PAPERBACK. 1250307996 Item in very good condition! Textbooks may not include supplemental items i.e. CDs, access codes etc... . Very Good. Tor, 2018. Clean and crisp copy with no markings. . Science Fiction,. Soft Cover. Fine/No Jacket. Tor.com. PAPERBACK. 1250307996 Brand New! No Remainder Marks or Worn Dirty Overstocks! . New. Tor.com. PAPERBACK. 1250307996 *LIKE NEW* Ships Same Day or Next! . Fine. Tor.com. PAPERBACK. 1250307996 Special order direct from the distributor . New. TOR.COM. New. 8 x 5.09 cm. First softcover edition; signed by the author on the title page. 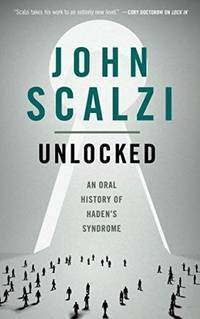 Fine in softcover as issued.Discover the history of Haden's Syndrome, the virus that created the world of John Scalzi's inventive near-future thrillers Lock In and Head On, in the prequel novella Unlocked.Not long from now, a virus will sweep the globe. Most will suffer no worse than flu-like symptoms, but an unlucky one percent will be changed forever. Hundreds of millions become "locked in", awake, aware, but completely unable to control their bodies.This is the story of the doctors, scientists, engineers, politicians, and heroes who remade the world. It is the story of the chaotic outbreak, the fight for a cure, the changes that followed. It is an oral history, straight from the mouths of those who survived the most dynamic period in human history.